There's something about Emily, the focus of today's reader design spotlight, that makes me think we should be friends. Sure, there's the practical "we both live in Seattle" part. But, we also chose bright turquoise couches as the focal point of our living rooms. I mean, that has to mean something, right?! I saw Emily's home pop up on Instagram a few months ago and was immediately in awe. It is quite modern but still cozy, neutral while being bright and deep. It's a perfect fit for a similarly rainy, gray, but oh-so-cozy and interesting place like Seattle; I like to think Seattle & London are sister cities. Does anyone else buy that? 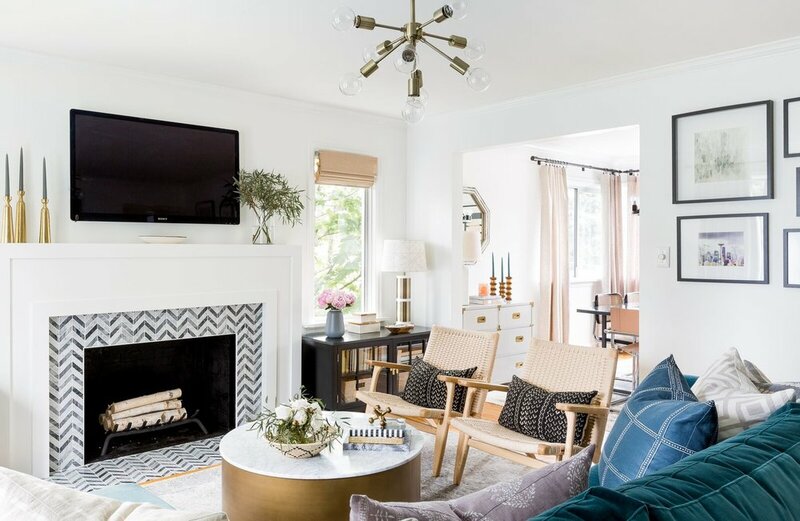 With a focus on classic and modern looks, Emily has carefully selected every piece inside this home, filling it up to the brim with pottery, textiles, and art. She grounds herself in things that hearken back to her design philosophy and uses that as her foundation for making decisions. This home has to be one of my favorites yet, and I encourage you all to follow Emily along on Instagram @cohesivelycurated for more! We really just scratched the surface.